Here is a list of the five highest rated electric nail and staple gun models. The list includes an overview of each product, with price category, info on the type of nails and staples and magazine capacity. Our list is in reverse order, finishing with the highest rated electric nail and staple gun. 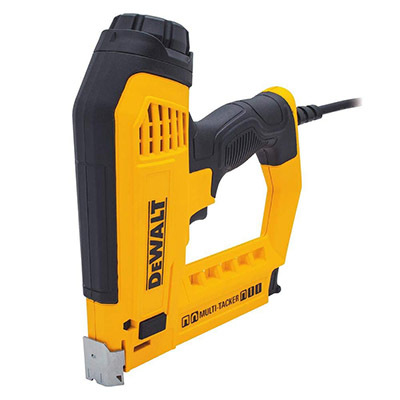 Having electricity behind a powerful brad nail or staple gun can be very convenient as you won’t have to lug an air compressor and air hose around for each and every project. 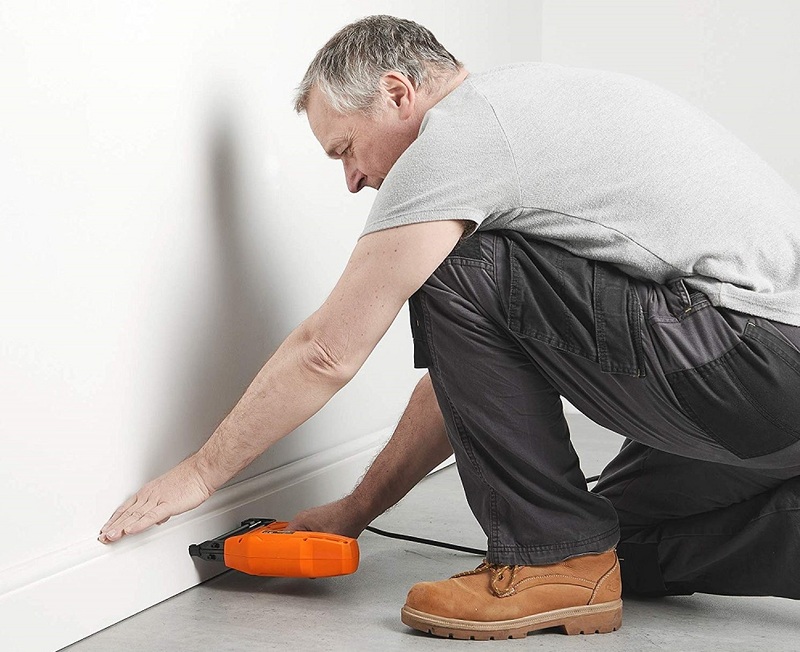 A great electric nail and staple gun will usually load a variety of staple and brad sizes, has decent power, and is light enough not to wear your hand and wrist down. 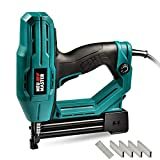 The NEU MASTER NTC0040 electric staple/brad nail gun is great for heavy duty use in projects like home improvement, wood pallet, roofing, and more. It features a contact safety pole to stop unintended firing, a no-mar rubber nose tip to prevent marks on wood, and an impact control adjustement knob. This gun’s firing speed is 20 nails/ staples per minute. 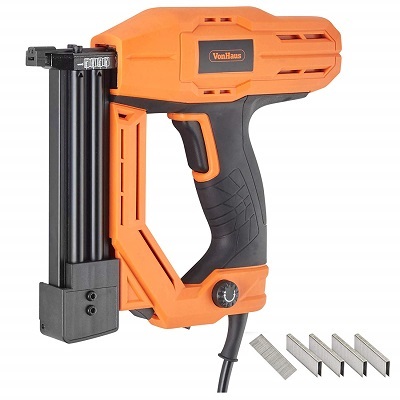 Overall, it is a quality electric staple/ nail gun with a great design, and decent power. The VonHaus electric 18-Gauge nailer and stapler is the perfect machine for light fastening jobs that will spare you the inconvenience of carrying around an air compressor and hose. It comes with a fast firing mode that enables you to shoot 20 fasteners per minute and a power adjustment dial on the handle to easily set the needed strength for various materials. It works excellently with both soft and hard wood. 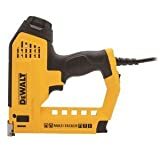 The first choice on the list of the five best electric nail and staple gun models is by Dewalt. This is a well-respected maker of all kinds of tools and construction equipment. Back to today’s key model, this multi-tacker is a flexible combination between stapler and nail gun. It loads a wide-range of staple and brad types giving you on-the-job flexibility. The DEWALT 5-in-1 Multi-Tacker and Brad Nailer comes with an edge as it loads from the bottom. This makes it fast and simple to load. 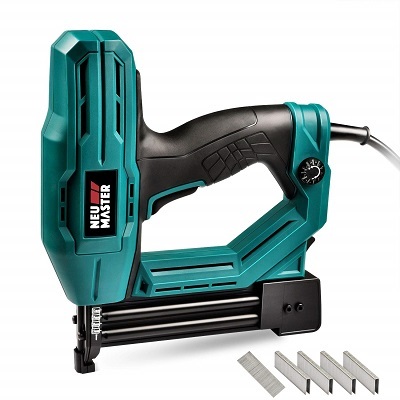 The next option on your list of the best electric nail and staple gun models offers a great deal of versatility. 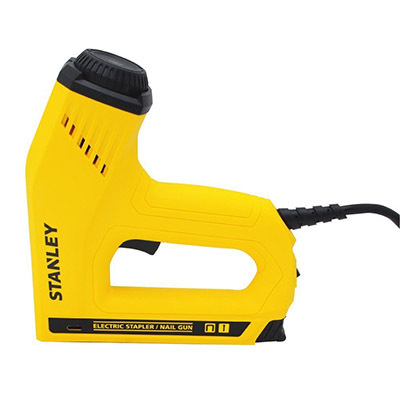 You can use the Stanley TRE550Z as a staple gun for jobs such as ceiling tile and carpet padding. Whenever the situation arises, you can quickly change to a brad nailer for hanging pictures or attaching trim and molding. It is hard to find a cordless electric staple and nail gun that is as powerful as an air gun and holds enough charge to carry most jobs to completion (400 nails or staples/ charge). This OrionMotor Tech model has the best of both worlds, as it runs on a generous Lithium-Ion battery and uses pneumatic technology for extra power. However, does not require a compressor or gas cartridges. What’s more, it has single firing and contact firing modes and a LED working light for those low visibility situations. 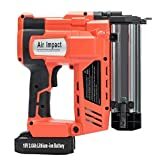 All in all the OrionMotor Tech 2-in-1 nailer and stapler is the most practical machine is the most powerful and practical electrical machine we have reviewed so far. These are the five electric nail and staple gun models that received the best customer reviews. If you’ve tried any of these guns, tell us about your experience!